Good news from DGD today. Apparently the new maternity scrub was a hit at her clinic today. She said she got lots of compliments. That tells me it actually fit since she wore it. Yeah. This afternoon DD and I attended a memorial service led by Hospice for all who died since October. We were chosen to light the February candle. Our Joey’s name was read under February. I hoped attending would help us. There were so many people there – so many names on the pages of deceased. Maybe it did help because every step we take outside of our own grief we learn to cope for another day. Maybe new insights came to us, we did a good bit of talking during the trip. We went through several tissues of course. Since we have been doing Wednesday night studies on the letters to the 7 churches in the book of Revelations and Kristy has been reading “The Rapture Exposed” we have been talking about the Coming of Christ and what it means. One thing is that Joey is asleep, he is at peace, no more suffering. We, on the other hand, must learn to pull out of our depression and find the joy in living on. It is stated in the Bible that we aren’t to grieve like people with no hope. It is important for us to remember our belief in the indestructible personal union with Christ’s own life – now and later. Being a techie kind of person, I have always wanted to know stuff as soon, if not before, it became available. Always wanted to know how things work, the whys were always big questions from me. So, I can understand people wanting to know when the end of the world is coming and their drive to seek the key to knowing this. Like reading Revelations and matching events through out time. What if God wasn’t on a human time line? What if we humans haven’t unlocked the code because it just doesn’t fit on that timeline? Do you think the Bible writers were inspired by God to tell us to be ready right now? Be about the business of the Great Commission now. Be about the task of loving as God loved us right now, everywhere, without reservations. We might not think the END is tomorrow, but what if it is? What if the end of the world as we know it – even though we hadn’t figured it out for sure – suddenly plopped down on tomorrow’s date? I think the answers have always been in front of us, calling out to us from the pages of the Bible. What did Jesus try to teach us? The teachings have been repeated often: Be ready, because only God knows the when, and He isn’t telling it. We still have a job to do as long as we still have the breath of life. Lately it hasn’t been my choice to live, and I find myself just going through the motions by doing the various activities with less feeling than I should. So, although it isn’t my choice to live or die, it is up to me to choose how I live my life. I can choose to live in my grief and be sad, thinking how much I miss Joey. That pain within me is my selfish desire to hold him and to love him and to do for him once again. But since that can never be, and it is contrary to the life God wants for me I need to work on making another choice. The Creator doesn’t choose for us. The choice to follow His lead is just that – a choice. So, do I accept what God has asked of me? Living in the light of giving my purpose over to doing good for others and sharing God’s love is the right choice. Isn’t that the Great Commission – to love others and share God’s love with them? Selfish creatures we are, it is so hard to look outside to the needs of others. But we crafters do just that, at least on a small scale I believe. Like sewing for my granddaughter. And making cards to send to people. I think this will make a nice note card to write a message in. I used watercolor pencils on the scene (Sarasota Stamps) and used patterned paper from K&Company, as well as some Stampin’ Up! 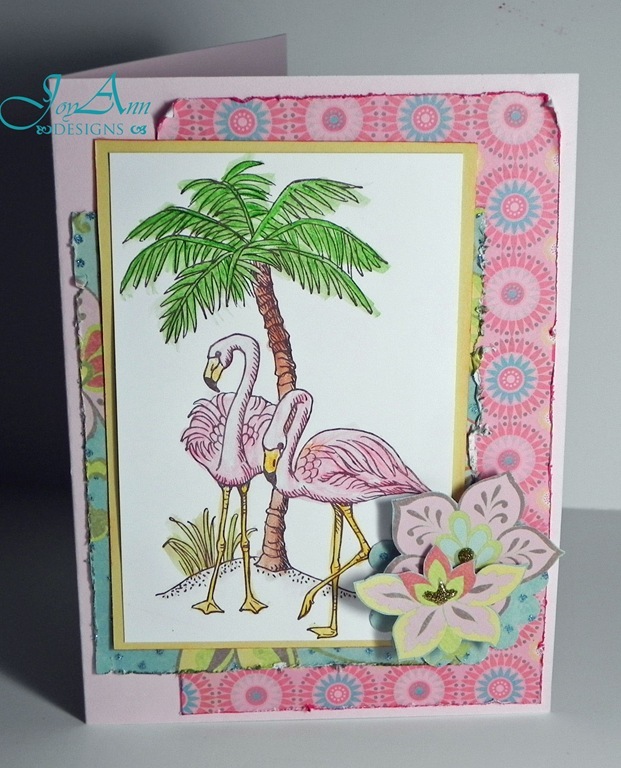 card stock – pink pirouette and so saffron. 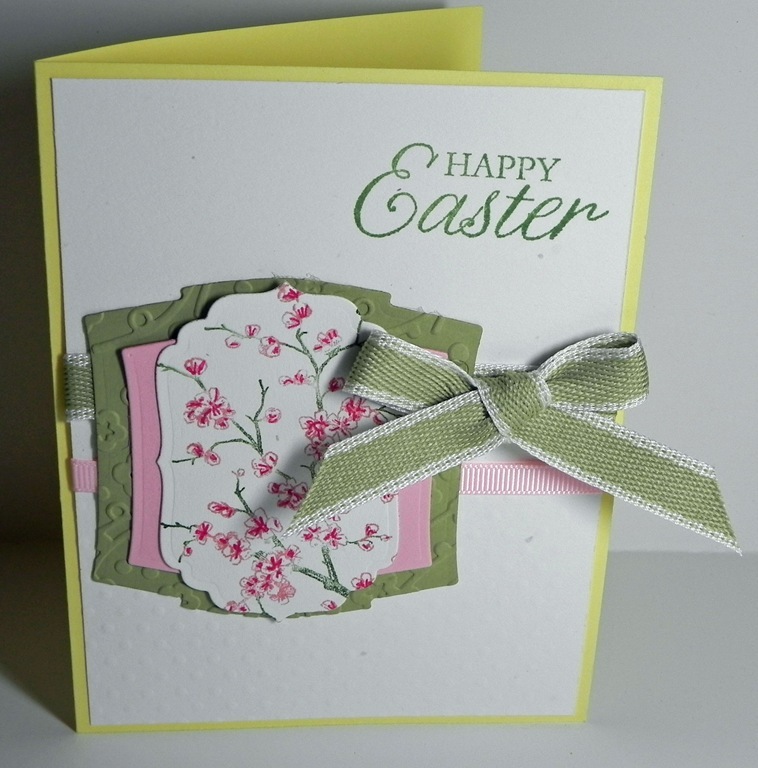 And here is another little Easter card using yellow, pear and pink. Loving that Pear Pizazz ribbon. The shapes were cut with Spellbinder dies. 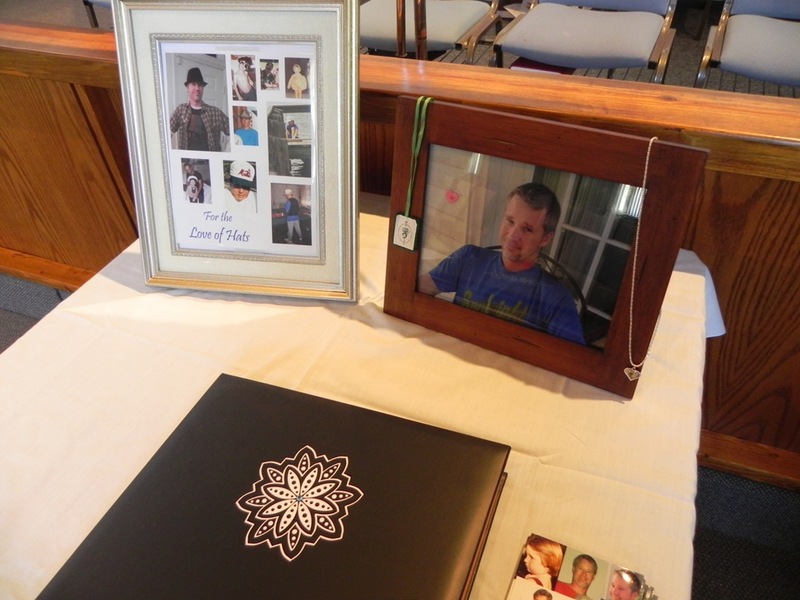 Our Memorial Service to celebrate my son was this past Saturday. It went perfectly as planned. I picked out the scripture and the music. After finding the recordings, Kristy made a CD for one of the church members to play at the appropriate times. Our dear neighbor and friend carried the crucifix in ahead of the pastor, followed by the 5 closest family members with all others standing in the church. Just prior to the start of the service I had “On Eagle’s Wings” played as a signal that we were starting, and because I wanted to fit that piece in. Neighbor Larry also did the first reading from Isaiah. We had practiced so he would get the pace and clarity I wanted. Although it wasn’t a problem since the words were written in the bulletin its fun to note that he said “A reading from the book of Israel”. Kristy did the second reading perfectly which was from the book of First John. 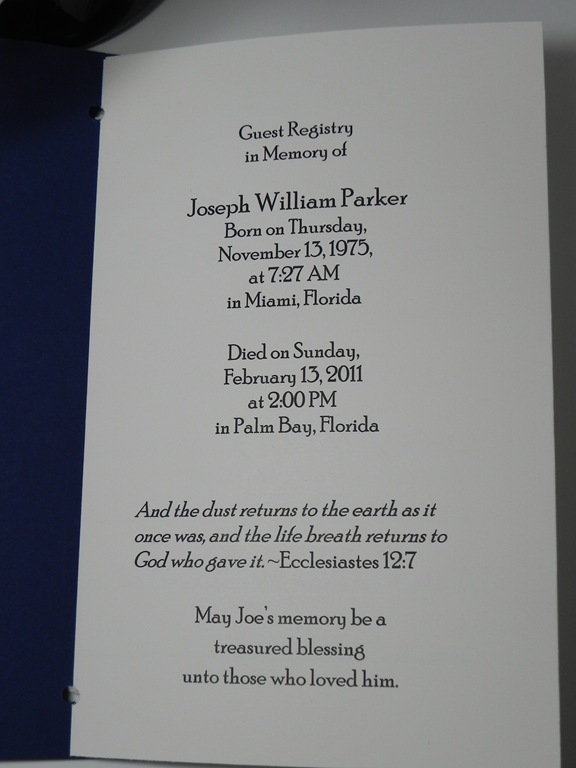 I wanted the message to go out the fact that true love is from God and that Joey truly had much love in him. Our pastor did a beautiful job. There were more than 50 people in attendance plus a number of ladies from the church who worked the food and the ushers who truly made everything run so smoothly. It was a pleasure to see some family and friends we hadn’t seen in a while. 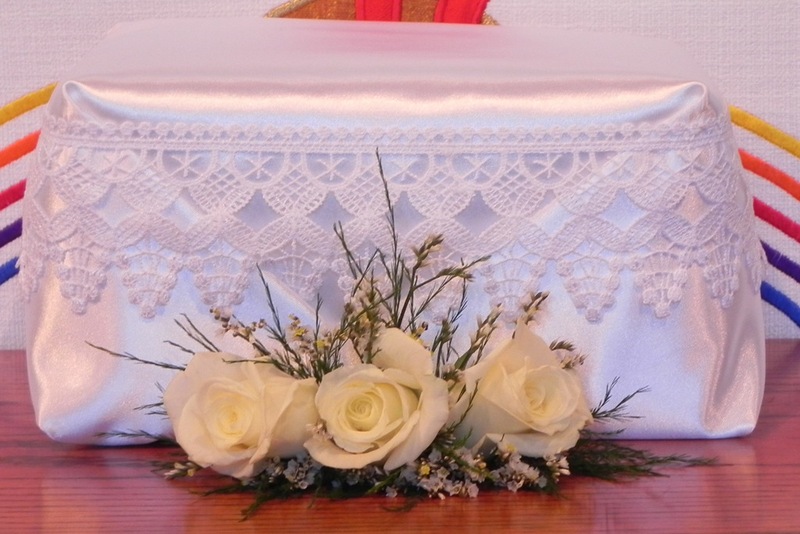 I wrapped the container of Joe’s ashes in satin and added a lace trim. I had the arrangement made to place in front of 3 white roses. This was placed on a table in front of the altar. For me the 3 roses symbolize first the Holy Trinity, but also the three of us as one loving and family unit – Joe, Kris and me. I picked the lace because it reminds me of the body and blood of Christ – see the grape like clusters along the bottom and the circle/wafer of the center row? And even the stars of Heaven are present. Being such a private person, we set up a small display table to hold photos mostly. I made prayer cards, I suppose you could say, by collecting photos and printing 4” x 6” photos. On the back side I added his dates and the prayer of St Francis of Assisi. If anyone takes this message of giving to others in memory of Joe with them, just think of the good that could be shared. I made the Guest sign in book from Stampin’ Up’s quality card stock. I used night of navy and very vanilla. 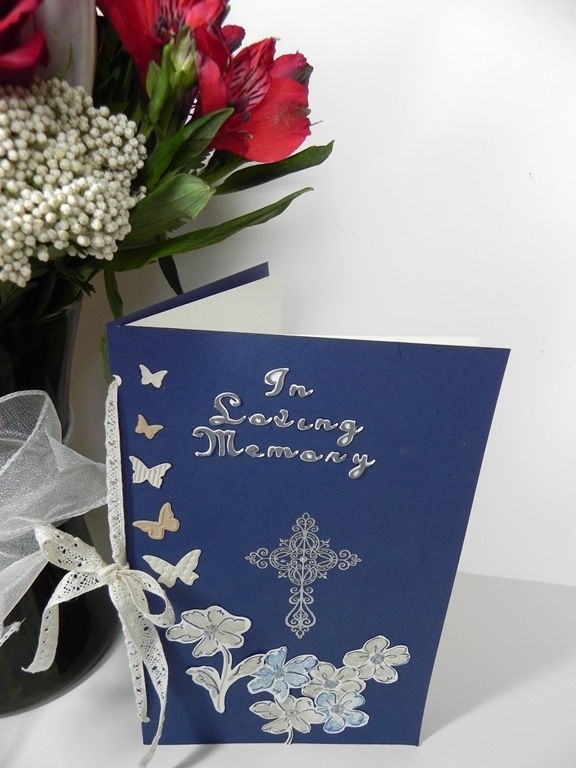 The words “In Loving Memory” on the cover are made with the Cricut using basic gray and vanilla. The cross is stamped and heat embossed with silver. The flowers are from the “Heartfelt Thanks” SU set and are cut out. The butterflies are from a die by SU. The inside is computer generated as were the pages with the lines titled “Guests”. The book is tied together with SU’s crocheted trim. The pastor printed this on the back of the bulletins that I wrote. It was my attempt to find peace within as I face each day without him. I will see you in its renewing effort of life. I will forever see them now with a remembered love of you. in the corner of my heart. finally free to embrace eternity.